Florida Black Bear. Photo by Carlton Ward, Jr. The Sierra Club and 11 organizations filed an emergency amicus brief Tuesday in support of Speak up Wekiva's appeal to stop the Florida Black Bear Hunt on Saturday, the first sanctioned hunt in 21 years. The brief was filed on behalf of Animal Hero Kids, Animal Legal Defense Fund, Animal Rights Foundation of Florida, Animal Welfare Institute, Center for Biological Diversity, CompassionWorks International, Environmental Action, Jungle Friends Primate Sanctuary, Lobby for Animals, South Florida Wildlands, Sierra Club and Stop The Florida Bear Hunt. The original suit was brought by Speak up Wekiva, Inc. and Charles W. O’Neal against the Florida Fish and Wildlife Conservation Commission. On October 1, a Leon County judge ruled the hunt could continue. The amicus filings can be found here and here. 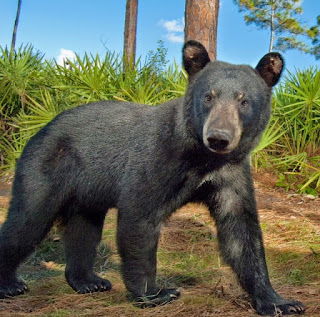 The iconic Florida Black Bear was protected by the Florida Fish and Wildlife Conservation Commission (FWC) as “threatened” for more than four decades until 2012. From a low of 300 bears, legal protections and conservation methods led to the population increasing to approximately 3,000, still nowhere near its historic population of 12,000. FWC cited bear-human interactions as a main reason for the hunt but admitted that better trash management and bear-proof trash cans were the best deterrent. The Florida Black Bear hunt is set to start Saturday, Oct. 24. TAKE ACTION NOW: Call Governor Rick Scott at 850-488-5603 and tell him to ask the Florida Fish and Wildlife Commission (FWC) to Stop the Bear Hunt.